Stand in the mountain posture with your feet at hip width and arms at your sides. As you inhale, slowly raise your arms out from the sides and up overhead and then pause. As you exhale, bend forward from the waist and bring your head toward your knees and your hands forward and down toward the floor in the standing forward bend. Keep your arms and legs soft. Then pause. Bend your knees quite a bit and as you inhale, sweep your arms out from the sides, but only come halfway up with your arms in a T (half forward bend). 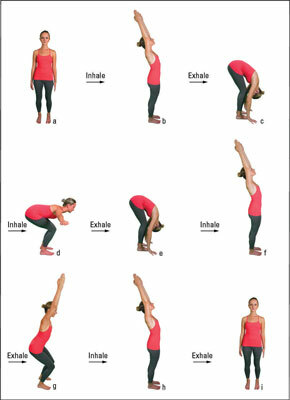 As you exhale, fold all the way down again and hang your arms in the standing forward bend. As you inhale, sweep your arms from the sides like wings and bring your torso all the way up again, standing with your arms overhead in the standing arm raise. As you exhale, bend your knees and squat halfway to the floor. Soften your arms but keep them overhead; look straight ahead. As you inhale, bring your torso all the way up again, standing with your arms overhead in the standing arm raise. As you exhale, bring your arms back to your sides as in Step 1. Repeat the entire sequence 6 to 8 times slowly. To make it harder on the last round, stay for 6 to 8 breaths in the half forward bend (Step 4), the standing forward bend (Step 5), and the half squat or half chair (Step 8). To make it much harder, do the entire sequence standing on your toes.